Need a party-perfect pasta salad to feed a crowd? 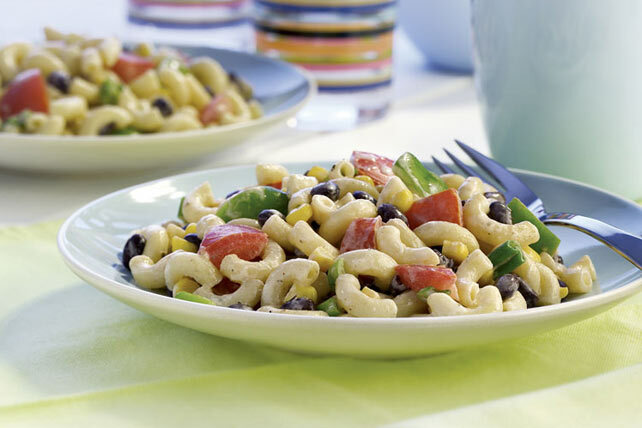 Our Creamy Southwestern BBQ Pasta Salad sure to win rave reviews. With only 15 minutes of prep, this pasta salad is ready in no time! Mix dressing and barbecue sauce in large bowl. Refrigerate 1 hour. Toss lightly before serving. Spice up the salad with hot pepper sauce or finely chopped jalapeno peppers. Add chopped ham or grilled chicken to salad before refrigerating. The green pepper in this colourful salad is a good source of vitamin C.